While understanding garbage collection fundamentals is vital to working with .NET, it is also important to understand how object allocation works. It shows you just how simple and performant it is, especially compared to the potentially blocking nature of native heap allocations. In a large, native, multi-threaded application, heap allocations can be major performance bottleneck which requires you to perform all sorts of custom heap management techniques. It’s also harder to measure when this is happening because many of those details are hidden behind the OS’s allocation APIs. More importantly, understanding this will give you clues to how you can mess up and make object allocation far less efficient. In this article, I want to go through an example taken from Chapter 2 of Writing High-Performance .NET Code and then take it further with some additional examples that weren’t covered in the book. Let’s start with a simple object definition: completely empty. In order to examine what happens during allocation, we need to use a “real” debugger, like Windbg. Don’t be afraid of this. If you need a quick primer on how to get started, look at the free sample chapter on this page, which will get you up and running in no time. It’s not nearly as bad you think. Build the above program in Release mode for x86 (you can do x64 if you’d like, but the samples below are x86). Ctrl+E to execute a program. Navigate to and open the built executable file. Execution will break at the beginning of the Main method, right before new() is called. Open the Disassembly window to see the code. ; You can use !dumpmt to examine this value. Note that the actual addresses will be different each time you execute the program. Step over (F10, or toolbar) a few times until call 006e2100 (or your equivalent) is highlighted. Then Step Into that (F11). Now you will see the primary allocation mechanism in .NET. It’s extremely simple. Essentially, at the end of the current gen0 segment, there is a reserved bit of space which I will call the allocation buffer. If the allocation we’re attempting can fit in there, we can update a couple of values and return immediately without more complicated work. ; for allocation. Add that value to the desired size. ; end of the allocation buffer. ; first 4 bytes of the object. In the fast path, there are only 9 instructions, including the return. That’s incredibly efficient, especially compared to something like malloc. Yes, that complexity is traded for time at the end of object lifetime, but so far, this is looking pretty good! Another thing to notice is the size of the object: 0x0c (12 decimal) bytes. As covered elsewhere, this is the minimum size for an object in a 32-bit process, even if there are no fields. Now let’s do the same experiment with an object that has a single int field. Follow the same steps as above to get into the allocation code. This is curious. The field is at offset 4 (and an int has a length of 4), so that only accounts for 8 bytes (range 0-7). Offset 0 (i.e., the object’s address) contains the method table pointer, so where are the other 4 bytes? This is the sync block and they are actually at offset -4 bytes, before the object’s address. These are the 12 bytes. Try it with a long. Showing a size of 0x10 (decimal 16 bytes), which we would expect now. 12 byte minimum object size, but 4 already in the overhead, so an extra 4 bytes for the 8 byte long. And an examination of the allocated object shows an object size of 16 bytes as well. If you put an object reference into the test class, you’ll see the same thing as you did with the int. Now let’s make it more interesting. What happens if the object has a finalizer? You may have heard that objects with finalizers have more overhead during GC. This is true–they will survive longer, require more CPU cycles, and generally cause things to be less efficient. But do finalizers also affect object allocation? We’ve lost our nifty allocation helper! We have to now jump directly to JIT_New. Allocating an object that has a finalizer is a LOT slower than a normal object. More internal CLR structures need to be modified to track this object’s lifetime. The cost isn’t just at the end of object lifetime. How much slower is it? In my own testing, it appears to be about 8-10x worse than the fast path of allocating a normal object. If you allocate a lot of objects, this difference is considerable. For this, and other reasons, just don’t add a finalizer unless it really is required. The field initialization was inlined into the caller! But what if we do this? This explicitly disables inlining for the object constructor. There are other ways of preventing inlining, but this is the most direct. Can you get the allocator shown above to jump to the slow path? How big does the allocation request have to be to trigger this? (Hint: Try allocating arrays of various sizes.) Can you figure this out by examining the registers and other values from the running code? You can see that in most cases, allocation of objects in .NET is extremely fast and efficient, requiring no calls into the CLR and no complicated algorithms in the simple case. Avoid finalizers unless absolutely needed. Not only are they less efficient during cleanup in a garbage collection, but they are slower to allocate as well. Play around with the sample code in the debugger to get a feel for this yourself. 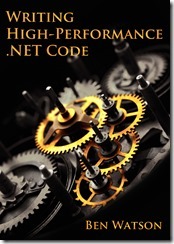 If you wish to learn more about .NET memory handling, especially garbage collection, take a look at the book Writing High-Performance .NET Code. This entry was posted in .NET, Code, Software Development, Tips and tagged .net, allocation, debugger, finalization, garbage collection, gc, performance, Windbg on September 29, 2014 by Ben.